Jannat kay pattay novel pdf download or read online jannat k pattay novel by nimra ahmed, high quality single page complete pdf file. Script of jannat kay pattay novel is based on a very sensitive topic, which is also close to my heart. Jannat k pattay is story of pain takers and selfmate people. The novel describes, self efforts of those people who finds their path with courage and determination. They never advertise their pain posters in front of others. This is story of such persons, who never perform good actions. They feels that, they are not suitable to perform well in particular environment. The people who wants to obey ALLAH’s orders, but feels difficult to perform due to environmental pressure. They wants to walk on right path, but never find any motivational response around them. Jannat kay pattay novel is write for same motivational encouragement. This novel never force anyone to adopt any particular side, but It will definitely say something like. If you never wants to do right things, and as well never create hurdles and problems for those, who wants to keep jannat k pattay in their hands. Don’t become banu qurayza for the fighters of Ahzab battle. The people who perform and obey the orders of ALLAH. Encourage those brave people. Do not try to give them punishment, for acceptance of ALLAH’s orders. Download or read online jannat kay pattay full novel pdf. Nimra Ahmed is writer of this beautiful novel. She is one of very famous Urdu novels writer in Pakistan. Nimra Ahmad has write many urdu novels for different Urdu digests and magazines. You can visit Complete List of Nimra Ahmed Books. Jannat kay pattay novel is one of her masterpiece. This novel is written for youth, because the events of novel rotating around the moderen young generation characters. We are going to build large collection of Urdu books and novels. Where users can read the books online and also download them in PDF format for offline reading. You can share these Urdu books and novels with your friends and family members through social media sharing buttons, which are available each post of our site. This time you are watching, one of most famous and beautiful Urdu Novel Jannat k Pattay by Nimra Ahmed. 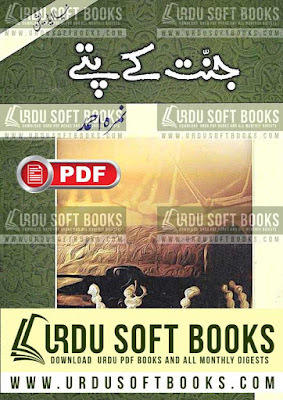 Using below links you can read online or download Jannat K Pattay by Nimra Ahmed in PDF format. Your feedback and comments will help us to improve our collection of Urdu Novels.